For one, few companies actually take the time to calculate the hard and soft costs of even a single mis-hire. Ignorance is not bliss in this case. 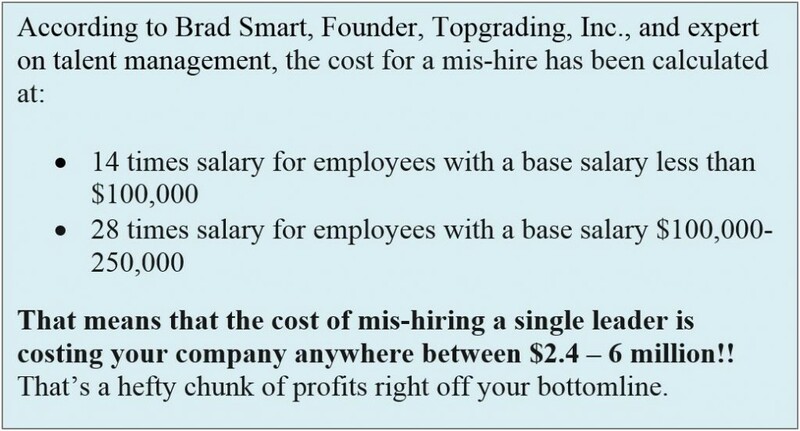 The higher the level of the position, the quicker the cost of a mis-hire increases exponentially. According to Guy Kawasaki, best selling author and former Chief Evangelist at Apple, there is another hidden high cost of mis-hires. “’A’ players tend to hire ‘A’ players; ‘B’ players tend to hire ‘C’ players and so forth.” How does that translate to you and your organization? If you are hiring anything less than “A” performing leaders, your leaders will hire mediocre employees that are not as good as they are, due to their own insecurities. Perpetuating that under-performing cycle throughout the organization, your “B” and “C” leaders will cost you many times more than the $6 million we quoted above. 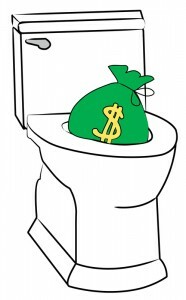 Can your bottomline afford that? Why Is the High Cost of Mis-Hires Rampant? Hiring decisions are at least 80% made as “gut feeling” or “based on appearances” — such as, “I liked the person,” “they seemed honest and hard working,” etc. Scarcity and/or urgency mindset — a belief that few candidates have the skills you need or you are driven by outside pressures to fill the spot immediately and settle for mediocre candidates. As a hiring manager, you are dazzled by first impressions, how good the person looks on paper, credentials, advanced degrees, well-prepared interview responses, etc. In addition, the highly competitive job market has triggered an increase in exaggerated claims, embellished resumes and “half truths” often missed in the hiring process. Not understanding the difference between and/or having the needed tools to discern top talent vs. best fit talent. With all the buzz about hiring top talent, many companies seek the most impressive backgrounds, past successes and prestigious credentials in their pursuit of top talent without any regard to best fit talent. Past success and experience are often an unreliable predictor of future performance. Why? Because different people are motivated by and excel in different work environments, organizational cultures, job opportunities, etc. Competencies and skills only account for 20% of future performance. The right attitudes, motivations, values and goals for a given role and company predict 80% of performance. What are the 5 Best Secrets to Avoiding Costly Hiring Mistakes and Finding Best Fit Employees? Secret #1: Shift your mindset from hiring employees to hiring partners. Your employees are your most important partners and stakeholders. Hiring employees is like finding the best marriage partner or close circle of friends. You seek those who have similar values, will make you a better person and provide synergies for both of you to create something bigger than you can individually. While you may value their past accomplishments and expertise, it’s what’s on the inside and the synergies between you that will make that partnership fly. Secret #2: Hire those with the capacity to excel and exceed you. I emphasize finding those with the best capacity to excel and outperform others, including yourself. Capacity not only includes current capabilities. Capacity also includes the right mindset, motivational drivers and thinking necessary to ignite future potential. It takes extraordinary self-confidence, soul searching and inner security for leaders to recognize when they hire those that exceed them, everyone wins. Secret #3: Hire “A+” players based on attitude, motivation and culture fit. How you assess best talent fit for your company and for each role is the single most important ingredient to successful hiring and maximizing employee performance. The best tool I have found to help clients assess attitude and motivation fit is an online assessment tool (IWAM), uncovering 48 unique attitude and motivation drivers that best predict future performance. Although all patterns are important in varying degrees, there are usually 6-8 drivers most critical for company/culture fit and a handful of other drivers important to A performance in a given role/function. For more info about how IWAM can help you hire best fit talent, go HERE! In addition, to further assess culture fit, it is important that leaders learn scenario building interviewing skills, or hypothetical “what if” questions for assessing values and traits, without the candidate’s awareness or ability to prepare for such questions. Secret #4: Develop a mission statement, results-oriented job description and list of non-negotiable traits before you start the hiring process. You can’t know how to assess a best fit candidate unless you know why you are hiring someone, how will their contributions impact company goals and be measured and what traits are needed to excel in that specific role. Most job descriptions are long laundry list of tasks and responsibilities without justification why the position exists or a scorecard how to evaluate success and performance. Without this information, the probability of finding those with greatest chance to succeed and raise the game is very low. Secret #5: Stop relying on intuition; start relying on unbiased, objective due diligence. I’ve have heard too many leaders’ hiring regret stories. Examples of when they were convinced a candidate would work based on feelings and impressions, only to find after a year of frustration, procrastination and endless coaching, that they made a mistake. A million dollar (or more) mistake, at that. To avoid this pitfall, develop a rigorous hiring process. Develop screening criteria and use objective data to eliminate candidates right away. Examples could include driving history check, credit check, drug tests if necessary, etc. What you are seeking are personal records that reflect a candidate’s character. Also check character references, asking truth-telling questions, like … on a scale 1-10, how well did the candidate get along with co-workers? And, why that #? Hiring, by no means, is a science. Even with the best hiring systems, mistakes will be made. The key is to hire slowly, fire quickly. 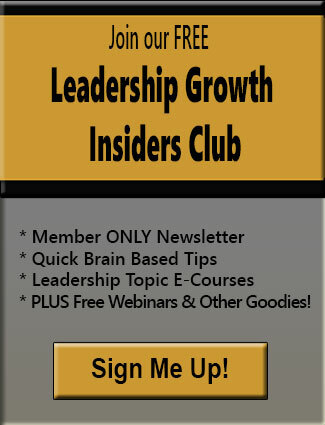 Your credibility and reputation as a leader, inside and outside, depend on it. Be rigorously honest about your past hiring mistakes, your own hiring blindspots and the changes you will make to start hiring your best employees. Let’s keep the conversation going. Visit our blog to share your comments, biggest hiring mistakes, stories of regret, burning questions and valuable resources for finding and hiring best fit employees. We want to hear from you! Posted by Denise Corcoran on October 30, 2013 in Hiring Practices, Leadership Performance, Organizational Performance, Top Talent and tagged A players, assessments, brad smart, culture, employee performance, excellence, hiring mistakes, intuition, job description, leadership performance, mindset, motivation, top talent, values, Zappos.